Last week’s Annual Fundraising Dinner was a tremendous success. A huge “thanks” goes out to everyone who participated! We had the opportunity to move the venue to comfortable, yet spacious Victory Baptist Church this year. The extra room gave us the opportunity to invite more people. And the Table Hosts did just that by adding more tables that would have exceeded the capacity of last year’s location. The evening started with great food and music. The background ensemble was performed by members and friends of the Nashville Praise Symphony, a community group that has given a benefit concert for the center the past two years. The program began with a live Q&A session with two of our Client Services Coordinators where we got an inside look into the daily challenges and great triumphs of working with our clients. Then our director gave us an update on how much the center has grown in 2015 and what we look forward to this year. Which then brought up Dr. Boles to give us a perspective and stories about Ultrasound. And lastly, we looked into the aspects of Imago Dei in our center, our clients, and our partners. The generosity of our partners will enable this ministry to do great things to the glory of God in 2016. 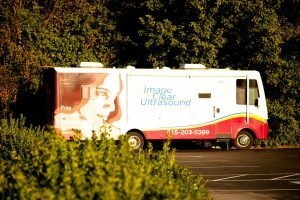 As an added bonus, many were able to tour the mobile ultrasound unit we’re hoping to host on a regular basis in the near future. Thanks to everyone who attended and promoted this event. Go ahead and plan to come again next year. Empowers individuals to make life-affirming decisions through education, counseling, and compassionate care, based on the ministry of Jesus Christ. Pregnancy Care Center does not offer or refer for pregnancy terminations or birth control.